If you have impaired vision or need specific accommodations when using the touchscreen and other Tab 4 NOOK features, you have options. You’ll have a chance to make these settings the very first time you turn on your Samsung Galaxy Tab 4 NOOK, but you can also make those changes later. Swipe down from the top of the screen and tap the Settings (gear) icon. Choose the Device tab at the top of the screen. On the left panel, tap Accessibility. Choose an option from the sections in the right panel: Accessibility, Services, Vision, Hearing, Dexterity, or Recognition sections. Auto Rotate Screen. This option is available in other places, too. Tap a check mark to rotate the view onscreen if you change the way you hold the tablet. If you don’t want it to rotate, leave this option off. Screen Timeout. Select the period of time before the screen shuts off. I recommend at least two minutes, or perhaps more. It depends on how often you let your mind wander; I regularly drift off into very important but soon forgotten daydreams of several minutes in length. Speak Passwords. This setting seems misplaced; if you put a check mark in the box, and if you turn on Explore by Touch (which is an option you can find under other settings), the tablet will read out any entry you make in a password box. Single Tap Mode. This option lets a single tap stop or snooze (temporarily delay) an alarm or calendar reminder. Show Shortcut. This option adds accessibility options to the Power/Lock key. If you do turn on advanced features like Explore by Touch, I recommend adding this shortcut to allow for a quick exit from that feature. Manage Accessibility. You can save all the changes you’ve made to vision, touch, and sound options and update the file as needed; you can also share your setup with another device if this file is created. There’s only one Accessibility service in the Services section in the version of Android used in the initial release of the Tab 4 NOOK. More may come later. When you turn on TalkBack, your tablet starts narrating virtually everything that’s displayed on screen. It also confirms the names of icons you tap or actions you take. To turn on this feature, touch the switch at the top of the screen; an advisory will ask for permission to monitor your actions, inspect the contents of windows you’re interacting with, and most importantly of all, turn on the Explore by Touch feature. TalkBack and the associated Explore by Touch are truly impressive features of Android that are of great help to people who are visually impaired. If that’s not you, this is almost certainly not something you will want to turn on. Your tablet’s behavior will be radically changed and its reactions will be (purposely) much slower. If you want to explore TalkBack and Explore by Touch, first turn on Show Shortcut in the Accessibility section. This lets you change or reset your settings much more easily by pressing the Power/Lock key. Font Size. The default setting is Small, but you can go up four stages to Huge or down two increments to Tiny. Magnification Gestures. Touch and slide the switch at the top of the panel to enable this feature. It lets you zoom in and out on an image by triple-tapping the screen; while zoomed in you can pan from side to side by dragging two or more fingers across the screen, and you can temporarily magnify something on the screen by triple-tapping and holding. Triple-tap doesn’t enlarge the keyboard. Also, magnification gestures may slow down some apps. Negative Colors. Touch this option to change black to white, and change colors to versions some people may find easier to see. You can also manually change some colors in the next option. Color Adjustment. Tap to display a description of the available adjustments, and then move the slider switch to On if you want to proceed. You’ll see color samples. It’s recommended that people using this tool make adjustments in an environment with normal indoor lighting. Notification Reminder. Move the slide switch to On to have the tablet beep — at an interval you select — to remind you of any unread notifications. Text-to-Speech Options. You can choose between the Samsung or Google text-to-speech engine. They both are quite capable; touch Listen to an example to select the one that’s clearer to you. You can also adjust the Speech rate, the speed at which the computer voice jabbers. Sound Balance. If you’ve got a set of earphones attached or are using an external set of speakers to play back music or the audio of a movie or television, you can adjust the sound balance; touch and hold the indicator and slide it left or right as desired. Touch Set to accept a change. Tap Cancel to back out and shut off the racket. Mono Audio. If you’re listening to your tablet using a headset with only one earphone, you can merge the stereo channels into a single mono signal. Turn Off All Sounds. 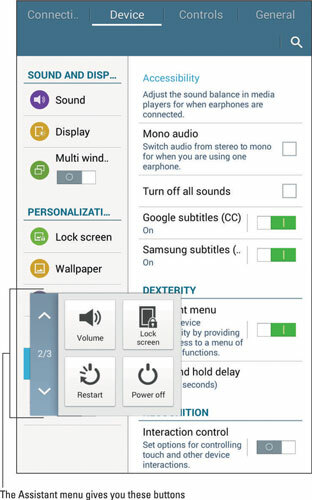 It does what it says; someone who is deaf or who otherwise doesn’t want unnecessary noise can choose this option to mute the tablet. Google Subtitles/Samsung Subtitles. 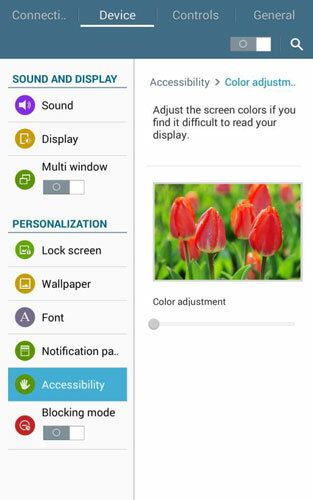 Touch and move the slide switch to enable one or the other or both schemes to display onscreen subtitles for certain apps. The Google system lets you change text size and the color and background of the subtitle; Samsung goes a few steps further by letting you choose a font and other effects. Assistant Menu. You can add a small Quick menu on most screens with larger, easier-to-use icons for many features, including volume control, power off, settings, and zoom. You can choose a dominant hand. It comes preset for righties. If you turn on the accessibility Quick menu, you get an onscreen button for screen capture (a picture of what’s onscreen). Many users find this single onscreen button easier to use than the combination of Power/Lock and Home; that combination requires more than a bit of dexterity and very precise timing. Press and Hold Delay. The tablet is set up to respond to a press-and-hold for certain functions; you can define just how long that hold has to be. This section lets you fine-tune some of the ways you use your hands on the tablet, including blocking areas of the screen so that they don’t respond to touch; this is useful if you hold the tablet with one or more fingers on the screen at all times. Turn on this feature by moving the slide switch at the top of the panel. Once it’s on, you can turn the function on or off, or change the settings by pressing and holding the Home key and the Volume – key at the same time. Note that you can’t turn on the Assistant menu if interaction control is turned on; you’ll be offered the chance to turn off the Assistant menu.